Improved grades and fewer students failing exams. These are the results that gave two projects at IKBM, the revered Teaching award 2009. The University Board has chosen to give the prize to two academic departments at the Department of Chemistry, Biotechnology and Food Sciences, IKBM. The prize is shared between the projects teaching of basic statistics (STAT100) and the teaching of chemistry as a supplementary topic. Behind the "Knowledge lift" in the topic STAT100 is Associate Professor Trygve Almøy, associate professor Ellen Sandberg and post doc. Guri Feten. In the project teaching “Chemistry as supplementary topic”, efforts have been made by professor Morten Sørlie and Professor Yngve Stenstrøm to increase the understanding and to reduce the exam failure rate. Both groups that now share the Teaching Prize of 2009 have worked actively with their approach to pedagogy to enhance learning in the difficult and important topics. In their recommendation the committee emphasized that the measures have improved the quality of teaching. The result has been better grades and lower exam failure rates among students. This year, there were a total of four nominees to the Teaching Prize of 2009. In addition to the two laureates was a robot project in interdisciplinary technology education at the Institute of Mathematical Sciences and Technology one of the four candidates. The responsible for the project, Hans Ekkehard Plessen and Odd Magnus Eng adopted new tools and robots to create a commitment to programming and computer science. The fourth candidate is at the Department of Plant and Environmental Sciences, and is about the Master in Public health science - an interdisciplinary innovation. Behind the project is the project responsible Grete Grindal Patil and Camilla Ihlebæk, Ruth Kjærsti Raanaas and Jorid Grimeland at the Oslo University College. This project shows new paths to establishing good new in health sciences, one of UMBs Master programmes focus areas. The Teaching Prize was created to stimulate the development of teaching and the quality of programs. The price will also encourage and motivate subject communities to become more concerned about working with quality of teaching. The prize is a project position with assets of office operations for three years. In addition, it is annually allocated 100 000 NOK unrestricted funding. Alternatively, an option is a cash payout of NOK 200 000 each year for three years. All prize funds to be used to support the improvement in teaching. By presenting the prize to the two subject communities the Committee for the Teaching Award wishes to encourage continued efforts to improve teaching within the large basic courses at IKBM. The Committee believes that it is possible to develop educational interventions that can be used in both topics and that have great transfer value to other major basic courses. A price to these two subject communities can thus form the basis for development of education in several related topics at UMB. This type of action helps to increase knowledge in the basic subjects, and throughput of students at UMB, which has implications both for the individual student, and UMB. 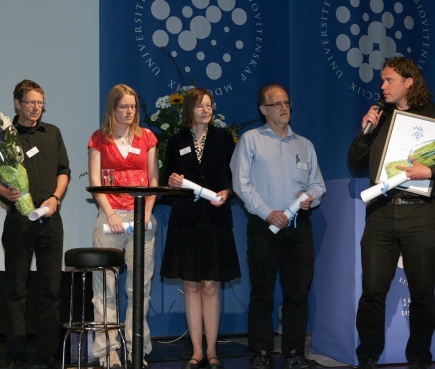 Adjudication Committee for Teaching Prize in 2009 was composed of Vice Rector Trine Hvoslef-Eide, head of IØR, Kolbjørn Christoffersen, fagpedagog by IMT, Knut Omholt and student representatives Kari Sofie Asmyhr East, IØR, Siri Øyan Lund Set, IKBM, Silje Vang, INA, Trygve Priest Farm, ILP . The committee chose to give the prize to the two academic disciplines that have made a basic and good work to develop the teaching of two basic courses. Basic courses are perceived by many students as difficult, and the majority of students are taking courses because they are compulsory and not because they have come to UMB to study chemistry or statistics. Interventions that are initiated are not necessarily innovative, but they have improved the quality of education in chemistry (KJM100 and KJM110) and statistics (STAT100) and resulted in better marks as well as lower failure percentage. The measures are implemented in cooperation between professionals and students. By presenting the prize to these two subject communities, the Teaching Prize committee seeks to encourage continued development of educational interventions that can be used in both topics and that have great transfer value to other major basic courses. Such quality-promoting measures help to increase students' knowledge of basic subjects and improves throughput of students at UMB, which is positive both for the individual student, and UMB.